Oh, this series. Inferno by Catherine Doyle is the second book in the Blood for Blood trilogy and oh my god, is it good. I felt like with this book Catherine Doyle took absolutely everything that I loved about the first book, Vendetta, and then just ramped everything up and gave me more. Inferno is incredibly exciting and addictive and action-packed! I loved the characters, the relationships, the friendships. This entire book felt like I was hurtling through everything at such a fast pace and like I just needed to hold on and enjoy the ride! As much as I'll try not to spoil the events of Inferno, this book is the second in a trilogy and as such, there will be spoilers below for Vendetta. If you haven't yet read that book, please stop reading now. Right from the beginning, I really loved Inferno. Sophie went through a great deal at the end of Vendetta and I'm glad Catherine Doyle showed Sophie really at her lowest trying to find some semblance of normal again and putting herself back together both physically and emotionally. Sophie may have been a bit broken at the beginning of this novel but she just continues to grow and grow throughout Inferno and it made my heart happy to see her do this. And I think the thing that helps Sophie so much is her incredible friendship with Millie. Wow, I love Millie. If I'm honest, I didn't pay that much attention to Millie in the first book so much. But Inferno was different. Millie was absolutely necessary to Sophie and I loved how close the girls are and how wonderful they are with each other. I love such a central female friendship in any book but especially this one. Everything to do with the Mafia was tense and nail-biting and surprising. Sophie does her best to take herself out of this thing she's in with the Falcone family but other things lead her right back there with them all. 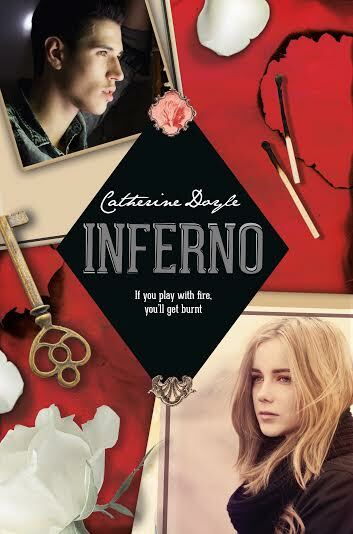 And in Inferno, Sophie discovers even more family lies and deception and it really goes to some dark places. And I loved exploring that darkness alongside Sophie. I was completely and utterly swept away in this series. This review is turning out to be a list of all the things I love about Inferno, but I'm sorry. I can't stop now. I haven't even gotten to the boys! First, there's Nicoli. Oh, Nicoli. Even during Vendetta, my heart had already jumped to a different ship, but I did find it fascinating reading more about Nic in this book. It was just really interesting and a little painful to watch Sophie interact with Nic and to piece through her feelings for him and to see him in this different light. And then there's everything delicious with Luca. Oh I love Luca. There's so much emotion there with the two of them. And that thing with the doughnut?? Swoonfest. My only complaint was this book is that it ended and now there's this awful, gut-wrenching wait for the next book! Honestly, this series of books is amazing and I love them. Do read them if you get the chance!